The Campagnolo Record 11 speed chain has been proven in everyday testing from professional cyclists around the world. Compatible with all advanced Campagnolo Record 11 and Super Record 11 groups. 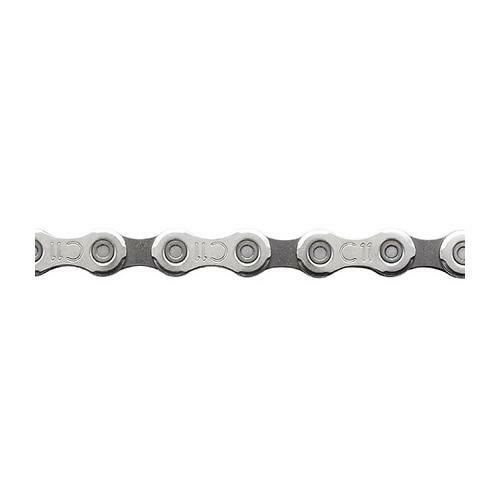 Best shifting and most durable chain out there! Record quality, paired with the Record 11 speed products you won`t go wrong. The only chain that I use year in and out. Price was right for a chain that I need. I get 3,000 to 4,000 miles on a Campy chain. Buy it! Shifts better and lasts longer than any other chain. Works on any 11 speed system. Use the 10 speed version on my mtb. Exceeds all other chains in performance and longevity. Don't learn this lesson more than once, as I have. Campagnolo drivetrains like Campagnolo parts. It is not worth meager savings to sacrifice quality. I easily get 10k miles use out of each Campagnolo chain I install. Super 11 speed chain from Campagnolo, used on super record. No jumping around, no hesitation in shifting onto cassette, just an excellent quality product. I tend to lube the chain every 100 miles and keep it clean, if you do this the record chain will last you all season long. Purchased this for when I need to replace my current Campy Record 11 chain, but the current one has 4000 mi and shows very little stretching with a chain measuring tool, so this chain lasts a long time. You just can't beat the quality of Campy Record. Been around in various guises for decades. its look perfect work perfect, and the delivery is reasonably fast! 5 stars! !